As tempting as it may be, cost should not be the driving factor in choosing the right wood for your project. Typically, softwood such as pine and poplar are less expensive. That’s not a problem, if you’re building a simple shelf or making crown moldings. If you’re building something that requires a little more durability, then those are not the choices for you. The largest determining factor in the wood that you will choose is the project itself. What are you building? Obvious question, sure but when it comes to wood, certain varieties are best suited for certain projects. For example, if you were building a butcher block, maple is an excellent choice. It has a closed grain, which can reduce the absorption of liquids into the wood and is relatively hard so that it can last a long time. Choosing either softwood or hardwood is an important first step for your project. Is your project something that will be rarely touched or used after being completed? If so then softwoods may be the answer. If your project is something that will be used often like a kitchen table or something that takes frequent bumps and dings like baseboard and doorways, then hardwood is a better choice. If your project is something that will be out in the elements, then you will need a hearty, rot resistant wood such as mahogany or teak. Cedar is another great choice. Hardwoods come from trees that lose their leaves in the fall -- otherwise known as deciduous trees. Hardwoods are more resistant to scratches, dings and dents and are best suited for making furniture and hardwood moldings. Softwoods come from coniferous trees such as pine and evergreens. Generally, soft woods are less expensive and are commonly used in the construction industry. 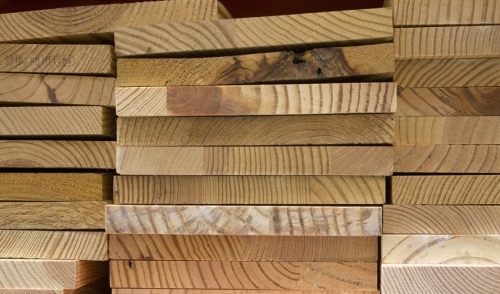 Softwood and hardwoods both have different methods of grading. Grading is an important part of choosing the wood for your project. This can have the largest effect on the appearance and finish of your completed project. The National Hardwood Lumber Association (NHLA) established a grading scale for hardwood lumber. The acronym FAS stands for first and seconds . The standard grades in descending order are: FAS, FAS One Face (or F1F), Selects, No. 1 Common (1Com), No. 2A Common (2Com), No. 3A Common (3Com). A full PDF of the NHLA can be found on their website. Softwoods are simply graded from 1 (construction grade) to 5 (economy grade). Another category of wood that is growing in popularity is reclaimed lumber. Some of the many benefits of reclaimed lumber are that recycled wood is often less expensive than new building material, it has already proven itself to be durable, and is a very environmentally friendly choice as it reduces the demand for newly processed wood. Of course there is the side benefit of the unique character and beauty that reclaimed wood offers. Keep in mind though; you still need to choose the appropriate density (hardwood or softwood) depending on your project. Some good examples of using reclaimed wood are hewn beams, old doors and moldings, or reclaimed barn board for siding (interior or exterior).